I live in New Zealand where, thanks to the efforts of people across our planet, we have eff all ozone layer and therefore incredibly high rates of skin cancer. I hate the feeling of sunburn (the stinging when you get in the shower! Argh) and so I’m reasonably diligent with sunscreen but guys – I have been super slack about hats for 35 years. Part of this isn’t my fault. I was born in 1983 and nobody wore hats on the playground when I went to school. I used to get tan as teak and developed an impressive blonde highlight. I remember sunscreen being a thing but not as fanatically as it is now, and I’m also sure it was about SPF15. Meanwhile: MASSIVE OZONE HOLE GROWING DAY BY DAY. This hat avoidance is particularly impressive (surprising? Disappointing?) because I spent 11 of those years as a Girl Guide leader, forcing young women to be sun smart and making them wear hats. While not wearing a hat myself. I became the adult I always swore I’d never be, enforcing rules while refusing to abide by them. I then did buy myself a hat about two years ago (proof!) and that began the conversion. I didn’t love that hat, but I did love the effect of the hat (i.e. being able to see things and not being so hot). Part of the issue is that I do, honestly, have an enormous head. When I sent in the form for my cap for graduation the woman rang me up to check the measurement. I tried on size L and XL hats on my trip to Hills Hats and I will give you no prizes for guessing where this noggin measured. In addition, I have ears that are like “yes, hi, have you seen me and here I am” and a forehead that is also not shy about its place on my face. I just have never liked how I look in a hat (except golfing and tennis visors which look weirdly excellent on me) and the proliferation of women with long tresses wearing hats on the internet has only served to reinforce a “look” that means that other looks – like my own – are unfamiliar and therefore trickier. Luckily, the internet is also full of women from history wearing hats, so I had a wee review of previous hat options (oh my god, so many). As we know, I was at first drawn to the boater because I thought I might look good in one like an earnest young man at Cambridge in 1937. Sadly (???) I don’t have the jawline of a 22 year old man and it was not to be. Cloche hats though. That’s my vibe, my niche, my ride or die hat opportunity AND this one was even better because technically it’s not a cloche. It’s supposed to be worn with the brim flipped up which I think is very “adorable rustic boy on a farm, probably in France” and that also is a look I’m willing to vibe with. Basically, I just like things that dip down behind my head in a way that fills in the void left by my short hair, and therefore acts as a balance or background to my ears. At 35, the sun damage to my face has already gotten in deep and is just waiting to surge to the surface over the next decade or so, so this is sort of “better late than never”, but I cannot emphasise enough how important it is to follow the Slip Slop Slap and Wrap rule this summer. I love being out in the sun, but man, I feel so weird about the amount of Instagram feed I currently have that is young women lying out in the sun with the goal of getting tan. That sun is a huge ball of radiation guys – it might be far away, but the heat you’re feeling is the result of a nuclear reaction. Get a hat and also, for the love of god, buy a proper sunscreen (your SPF15 foundation is not cutting it, I’m sorry but that’s a marketing gimmick). It will all be worth it when you’ve still got the cancer-free skin of a French farm boy when you’re 60. Tshirt is from Stine Goya at Wanda Harland a few years back (new season is in now, featuring horses rather than bees!). 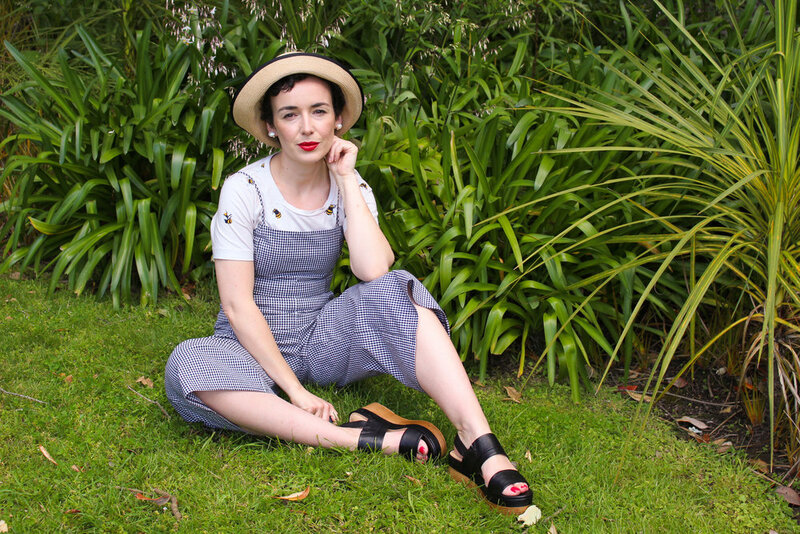 Jumpsuit is thrifted from the Kapiti Youth Store. Shoes were a hand-me-down from my Mum and are Chaos & Harmony. These are a similar design.